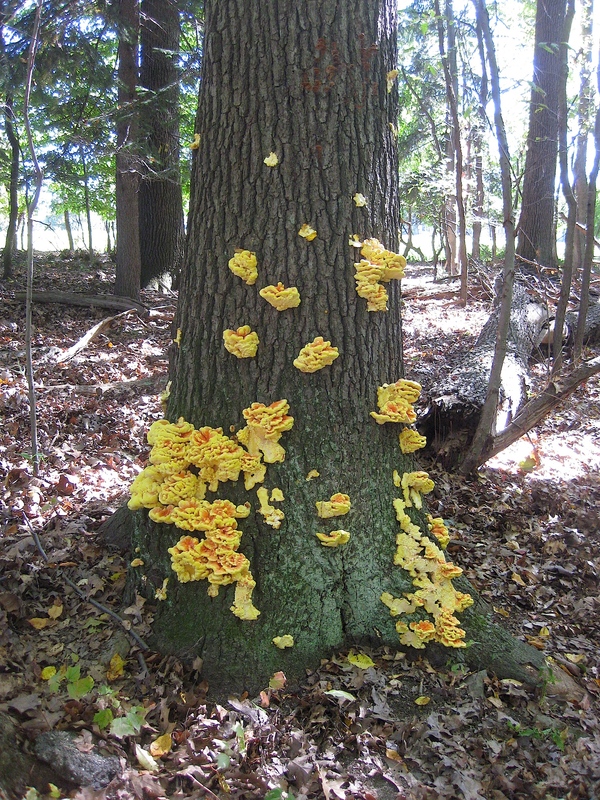 Chicken mushroom (chicken of the woods, Laetiporus sulphureus) isn’t just for the dinner table (if you’re not familiar with this edible fungus, it resembles chicken in taste and texture). Chicken mushroom is quite medicinal, and it’s the perfect way to let food be your medicine, and medicine your food. Research has shown that an extract from this mushroom possesses antimicrobial activity against the pathogen, Aspergillus flavus (Petrovic et al., 2013). Chicken mushroom is also a great source of antioxidants, including quercetin, kaempferol, caffeic acid, and chlorogenic acid (Olennikov et al., 2011), and it contains lanostanoids – molecules that have the ability to inhibit cancerous growths (Rios et al., 2012). What more could you ask for from a humble saprophyte? I harvested only a bit (as you can see, another hungry soul found this tree before me). And if you are signed up for the wild edible and medicinal plants workshop near Pittsburgh next week, I’ll introduce you to this tree (let’s hope it’s not completely picked over by then!). Categories: Foraging, Fungi, Medicine, Workshops | Permalink.